All the guest rooms at this beautiful little hotel (3 doubles and 4 suites) are decorated and furnished in period style and individually named: Swallow Nest, Stag Leap, the Green Suite and The Belle Epoque Suite among them. The house itself was certainly in existence as far back as 1523, and it is known that Goethe stayed here in 1797, noting it in his diary. It is, quite rightly, a designated historic monument, and the recent restoration of the property was undertaken with great care. 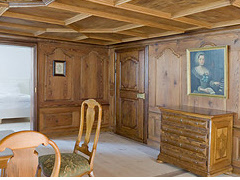 Situated by the River Rhine, the Gasthof Hirschen is a truly splendid piece of Swiss heritage.